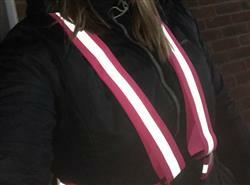 BTR High Visibility Reflective Sash will change size if you do. If you have extra or less clothing on then this is easily adjustable to wear over your exisiting clothing. Be visible by simply wearing the BTR Sash. Very pleased - far better and more durable than the plastic belts on offer elsewhere, this one is made from fabric (elasticated). It was easy and uncomplicated to order. The product quickly arrived and I now use it daily. Very pleased! I bought this so I was more visible on the pavement when walking the dog and cars now slow down when they pass me as they aren’t sure what they are seeing. Very good and easy to wear.